Rewarding Times have teamed up with TheGinBox.ie to celebrate their one year anniversary. Get an exclusive one off Valentines themed Gin Box delivered anywhere in Ireland for just €70. TheGinBox.ie is a subscription club for Gin Lovers. Every month, a new Gin Box is released with a full 70cl bottle of small batch gin. Tasting notes, details about the distillery and information on how to create the perfect serve are also included. A fantastic way for Gin fans to discover the latest Gin, and the best ways in which to serve them. Joining is easy, and subscribers choose whether they want to receive a Gin Box every month, two months or quarterly. Membership costs just €60 per box, or €70 for a one off gift (including free delivery). Find out more at www.theginbox.ie. Your Gin Box can be delivered straight to you or the recipient, anywhere in Ireland free of charge. Beara Pink Ocean Gin is made with Atlantic Salt water, Ventry harbour Sugar Kelp, Cranberry, Rosewater and Hand Picked Beara Peninsula Fuchsia, making a true spirit of the Wild Atlantic Way. It is available in 700ml and miniature 50ml. The Beara distillery team of four is based on the Beara Peninsula in West Cork. They have their own distillery with two stills, a traditional Muller Pot still and a larger more modern i-Still. They do everything in house and by hand from crafting their spirit with locally foraged Fuchsia to hand bottling and batch numbering the bottles. 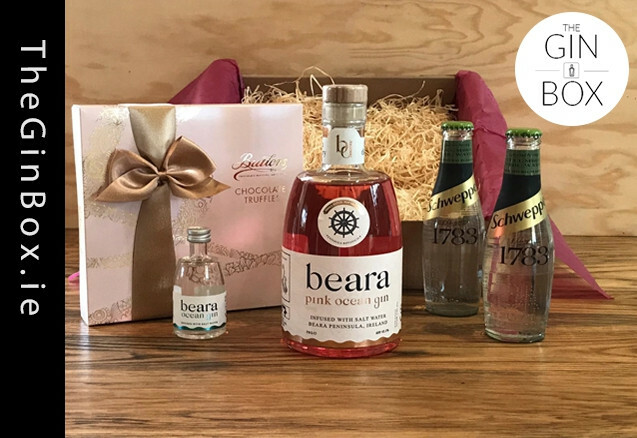 Both Beara Ocean Gin and Beara Pink Gin are available from Beara Gin Partners WineOnline.ie. The Schweppes premium range is made up of six innovative new flavour combinations, designed to marry perfectly with the finest white and dark spirits. The all-natural flavours are expertly crafted by world-class mixologists to please even the most discerning cocktail connoisseur. The luxury drinking experience is elevated further by the long-lasting effervescence that Schweppes is known for. Their Cucumber Tonic Water with sublimely sparkling fresh notes of cucumber marries beautifully with dry, floral gins like Beara Pink Ocean. You can subscribe for monthly, bimonthly or Quarterly gin deliveries at www.theginbox.ie and you can pause or cancel your subscription at any time. If you have any questions about ordering this exclusive offer, or about buying a subscription to TheGinBox.ie, you can call them directly on (01) 8867740. * Please note: If you would like your Gin Box delivered on Valentine’s Day in Ireland, remember to place your order with GinBox.ie redeeming your Rewarding Times voucher before BEFORE Tuesday 12th February at 10am. Orders received after this cut off cannot be guaranteed delivery on Valentine’s Day. Expiry for redemption is strictly March 23rd 2019 - No consultation will be entered into whatsoever after this date. When purchasing this deal with Rewarding Times you are buying a voucher. To organise delivery to you, you must redeem this voucher on TheGinBox.ie. Details will be on their homepage (you must purchase the hamper using your Rewarding Times voucher). For delivery on Valentine’s Day, we must receive the order BEFORE 10am on Tuesday 12th of February. Orders received after this will not be guaranteed delivery on Valentine’s Day. However - we will deliver after Valentine’s Day once vouchers are redeemed before the above expiry date.